Nestled on the outskirts of the Bolivian Salt Flats, our Uyuni accommodations boast a unique and unforgettable atmosphere for your Salar de Uyuni getaway. 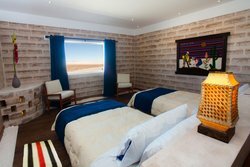 The creature comforts of home blend with traditional Bolivian culture in our hotel rooms built entirely of salt. Sink into bright, locally woven fabrics, unwind in your warm, plush bedding, and enjoy breathtaking views of the expansive Salar de Uyuni! 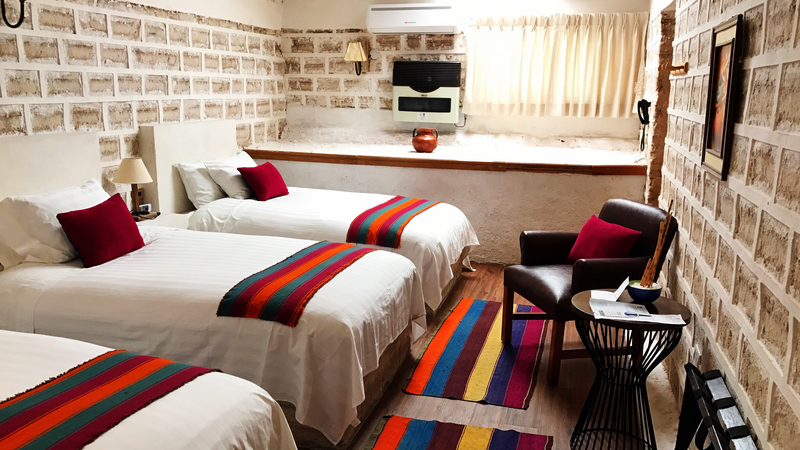 Well-equipped with thoughtful amenities, a stay at Hotel De Sal Luna Salada’s versatile lodgings ensure a pleasant and tranquil experience. Our sound-proof hotel rooms feature a telephone, private bathroom, work desk with lamp, chair, electric outlet, safe large enough to accommodate a laptop, and more. 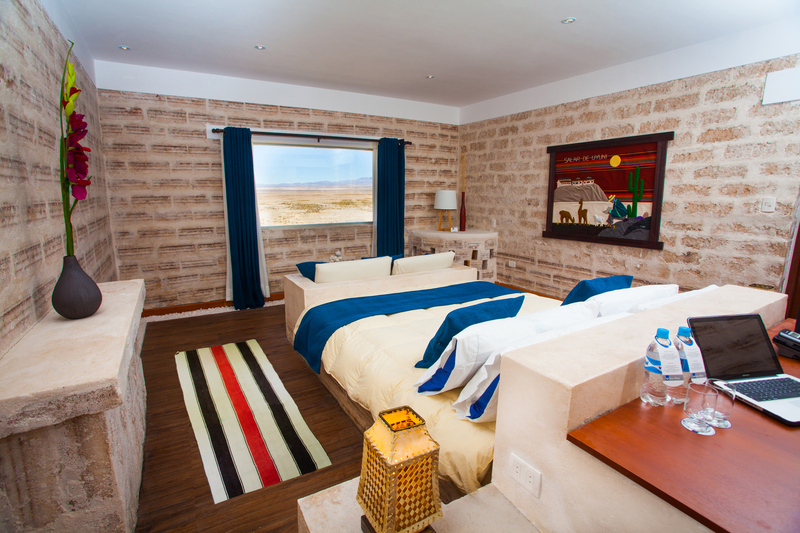 Nights in the desert can get quite chilly, so our central heating system will keep you warm and cozy! 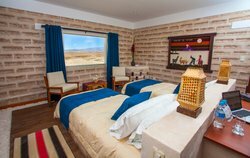 Our accommodations in Uyuni are designed for you to take full advantage of the silence, privacy, and wonder of the surrounding landscape. 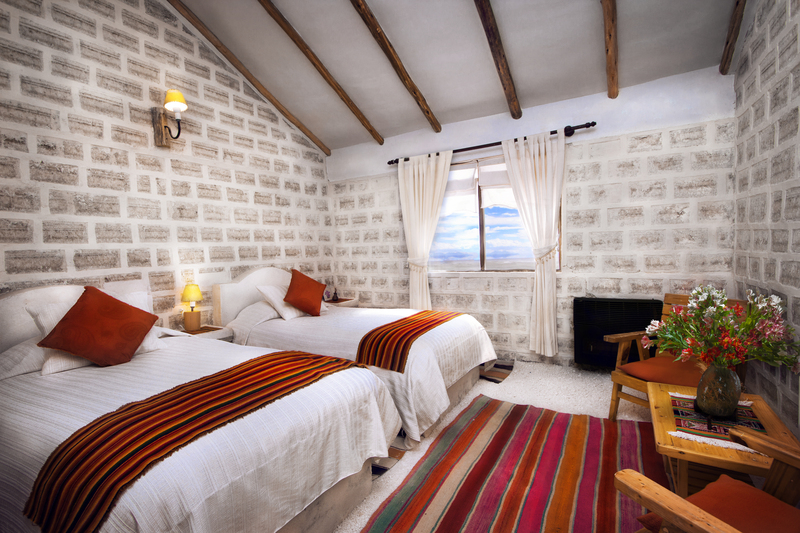 Relaxation awaits after a long day of exploring Salar de Uyuni and other great Bolivia attractions. At Luna Salada hotel, we actively seek disconnection from the everyday routine, which is why our rooms are not equipped with televisions – an amenity you’ll only find in the hotel’s common areas. 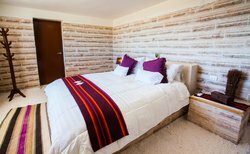 Don’t forget to take advantage of our special hotel deals and special packages to make the most out of your Bolivia vacation. 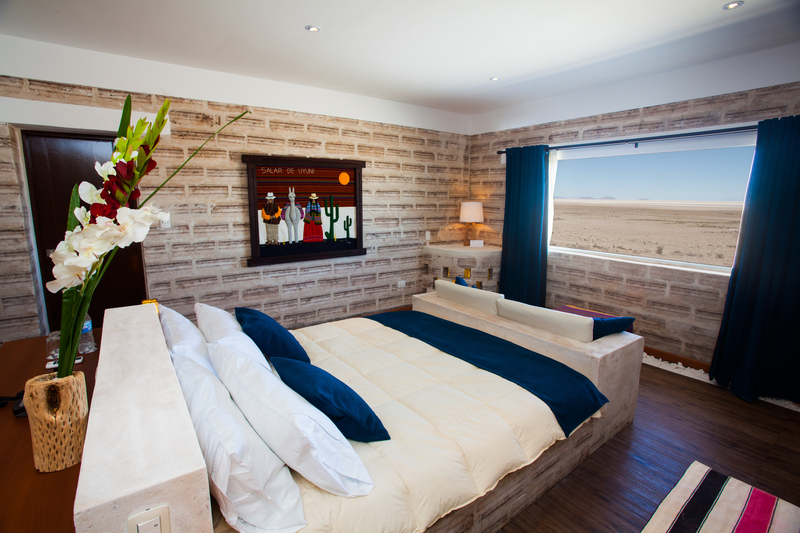 Book your Uyuni accommodations today: we look forward to welcoming you soon! Wake up to inspiring views of the Salt Lake every morning of your stay. This deluxe rooms, featuring a queen or two twin beds, include everything you need to enjoy your stay in a private, tranquil atmosphere. Enjoy rustic decor and locally made fabrics with colorful accents to brighten your stay with us. Deluxe rooms of Salt Hotel & Spa Luna Salada are designed to take full advantage of the silence, privacy, and spaciousness of the surrounding landscape, ensuring deep rest after a long day of excursion. At Luna Salada hotel, we actively seek disconnection from everyday routine, which is why our rooms are not equipped with televisions, which is only available in the Hotel common areas. Take comfort in a room with an inspiring mountain view and everything you need for rest and relaxation in Uyuni. 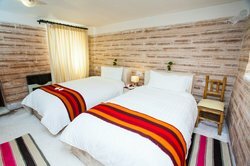 Each room is equipped with a queen bed or two twins beds offering premium comfort matched with plush pillows. Our soundproof rooms are designed to give ultimate privacy and tranquility in an inviting atmosphere. All the rooms of Salt Hotel & Spa Luna Salada are designed to take full advantage of the silence, privacy, and spaciousness of the surrounding landscape, ensuring deep rest after a long day of excursion. At Luna Salada hotel, we actively seek disconnection from everyday routine, which is why our rooms are not equipped with televisions, which is only available in the Hotel common areas. 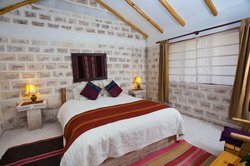 Our hotel offers family rooms for the most demanding tastes where you have the perfect combination of salt blocks, local fabrics, and colorful accents. 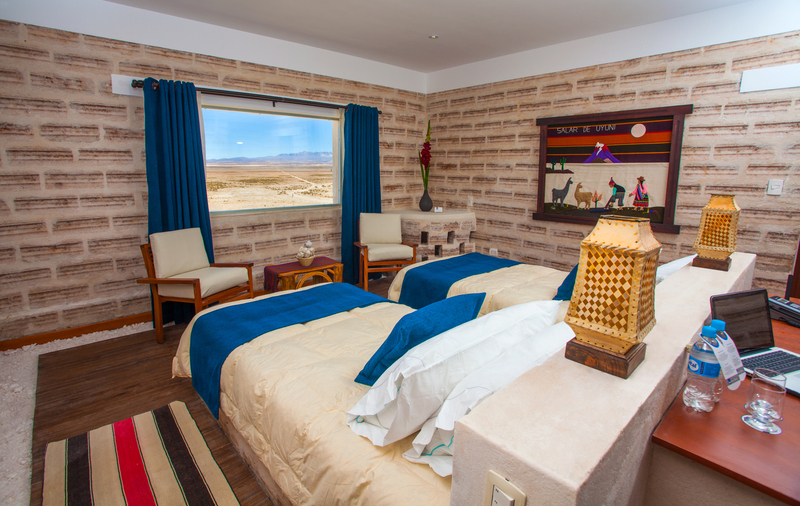 Each room is decorated rustically and well-equipped with everything you need to enjoy your stay by the Salt Flats. Perfect for groups traveling together. 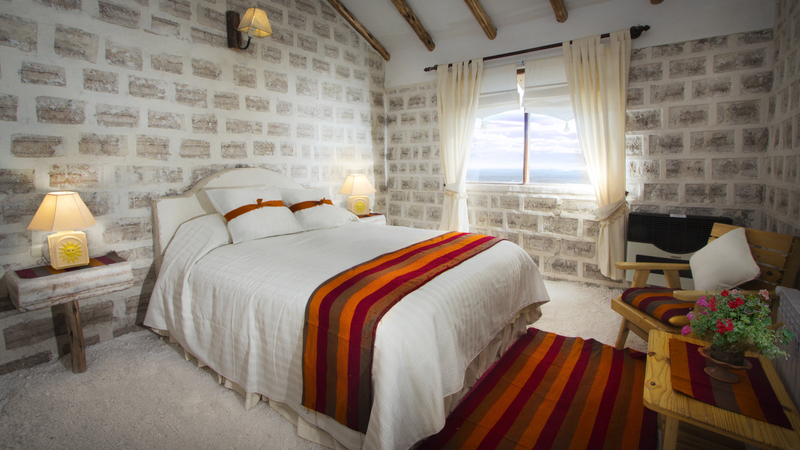 The triple room offers guests the comfort of three twin beds with enough rooms for you to stretch out and relax. All of our rooms are soundproof, air-conditioned and include a private bathroom.